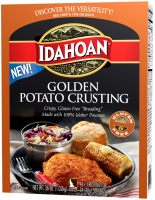 Idahoan mashed potatoes are the secret for creating a crispy, golden coating for delicious gluten free fried fish! Coat each fish filet in the potato starch, egg and then Idahoan® Golden Potato Crusting. Fry in 350°F oil for 7 minutes.